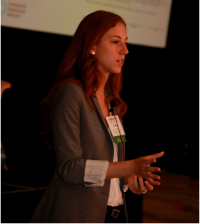 Emily Briglia used her experience with Community Healthcare Network (CHN) to walk her attendees through the process of incorporating health literacy best practices into the operations of a healthcare agency. In 2011, CHN, not-for-profit FQHC with 11 health centers in New York City serving over 75,000 patients each year, launched an agency-wide health literacy initiative that aimed to improve patient outcomes by creating an organizational culture based on health literacy principles. Briglia explained that CHN undertook this initiative because they see health literacy as the responsibility of all healthcare organizations. The traditional definition of health literacy applies to a patient’s own capabilities or skill set. For a health system to be effective, they need to evaluate how they engage consumers in the healthcare process and not put the oneness on the client. To implement this agency-wide campaign, health literacy initiative leaders helped CHN staff learn and apply important health literacy universal precautions with patients, such as plain language and the teach-back method. Using plain language can increase patient understanding of health information, but its adoption in health organizations has been limited, partially due to a lack of provider training. When facilitated properly, the teach-back method can check for lapses in patient understanding, uncover health beliefs, reinforce health messages, and open a dialogue with patients. The employment of both of these strategies is crucial to ensure providers are communicating with patients effectively. Participants completed various exercises including viewing teach back training videos, participating in teach back role plays, re-writing statements in plain language, and providing colleagues with constructive criticism on how to improve the facilitation of health literacy universal precautions. In 2014 alone, CHN’s health literacy leaders have presented for and/or trained over 1000 health care providers on health literacy. Upon completion of this session, participants were better prepared to incorporate these strategies into patient care, resulting in improved patient understanding.